Consistent. Obviously, others really like her style. This volume satisfactorily closes the trilogy. All is--more or less--put to rest.That the conclusion of Aeron's quest presents her with as big a challenge as the quest is appropriate and well presented.War in space is, at best, alluded to. The big battle at the end is again a land battle. Unconvincing. That earth would just hop into the middle of a galactic war stretches the credibility, too. The Imperium had not nearly the menace of well-wrought foes. Despite being told over and over of the peril of the Kelts and their allies, the reader never doubts they will win; the real question is the cost and, for the Kelts, it's pretty light. I loved the entire Keltiad series by Kennealy-Morrison. The concept and the characters really caught me and pulled me into the story; Aeron is one of my all-time favorite characters (if you are a Sarah Maas fan, and like Aelin, you would likely be fond of Aeron as well). 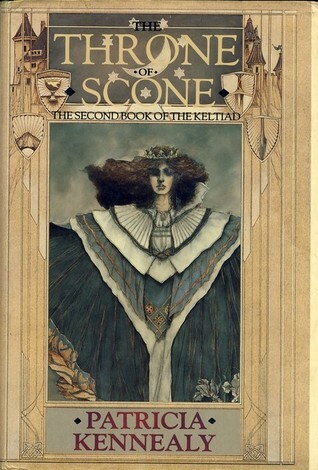 The Copper Crown and The Throne of Scone - one story.What a muddle!Okay, first things first. These covers are just gorgeous. Thomas Canty isn't given any credit in the actual books, but it's his artwork. (And he even sells signed prints of the images. )I fully expected to love these. I got a whole bunch of the books of the 'Keltiad' in advance of reading any of them. I don't think I'll be reading all of them.Fine, the premise is a bit absurd: In the 27th century, a probe ship from Earth discovers an interstellar Empire, Keltia, made up of the descendants of Celts who fled persecution by Christians back in the 5th century, and, aided by the denizens of Atlantis, went out to space.If it was done well, I could run with it. I love both space opera and fantasy; Celtic and pagan mythology is always full of good opportunities for stories. But it's not done well. The author doesn't pull it off. The minor problem is that a complex situation with a great number of characters is set up, and the writing just doesn't do it justice. I usually love twisty conflicts and court politics, but here, as I said earlier, it just feels muddled.The worst problem is not the complexity, however, it's the way that events seem to progress independent of any kind of logic stemming from characterization. People love and hate each other, turn traitor, change their minds, are loyal, etc - seemingly for no reason. One of the main characters (Sarah O'Reilly) is supposed to be a mature, competent naval officer. However, through both books she's written as if she's a star-struck, ditzy 10-year-old with a celebrity crush on Keltia's queen, Aeron. (And why would Earth military officers be impressed at all by foreign royalty? And why would Earth people instantly want to get involved in someone else's war?) Another thing that bothered me: the use of the phrase "Any road" on practically every other page. I know this is British slang equivalent to "anyways," and maybe the author thought it made her characters sound more Celtic? But it was used in places where no such interjection was necessary, and no single phrase should ever be used with the frequency that this one is in these books. In addition, the story seriously suffers due to the author completely failing to think things through logically. The people of Keltia have psi powers - but hardly ever use them, for no given reason. They and their enemies both have advanced technology including hyperspace ships - but don't use technological weapons. There's also magic - but with the exception of one past incident, the ramifications and potentials of that are not explored.When everything happens due to the author's "cause I said so," as opposed to because that would be the logical thing to happen in a theoretical scenario, things just get boring.I also owned the prequel to these, 'The Silver Branch,' but I've decided not to read it. I love this book, and the two that follow. This is a book for sci-fi/fantasy fans only--casual readers of popular literature will probably not like it. Aeron, the hero, is a true fantasy figure--she's beautiful, smart, gifted in magic and warcraft alike--her only flaw is her fiery temper.The premise is fascinating--what if space traveling Earthlings discovered, in the far reaches of the universe, several planets full of earthlings who had fled Ireland thousands of years ago as a result of religious persecution? And what if two neighboring planets chose that time to attack? The second book in the series. Continues the story of the overthrow of Aeron and the search for Arthur's treasures so that evil Jaun Akhera and his ilk can be tossed off of Keltia and the return of Aeron and her people. A LOT of action. Excellent read! Another must read. The second book in the Keltia series if you dont include the prequel. This describes Aerons flight to locate the 13 tresures of Author and save Keltia from destruction. Alomg the way she makes unlikely allies and changes the face of the galaxy for ever. This book is a great read. Third part of the trilogy. This series is so good I read them in the library and then had to buy them to have them forever. So good! Such a relief to past some of the cliffhangers but sad that the book is finished too. Just as enjoyable as the first. Finished the stuff off nicely. I probably read this series once every 18 months or so. Likely my favorite book series. It has the additional benefit of portraying my religion in a way that is accurate while accessible. Ok, once you get past the Kelts in space, it's really a great premise for an epic tale. And for those of who like to wallow in our "kelt iciness", it's a perfect book to do that with. Part of one of my favorite trilogies of all time. I'm very fond of this series. An inspired retelling of classic Irish Myth set forward several centuries into the stars.